Pt. Sur's Barn has had many uses since its construction a century ago as a place to keep livestock. (Its actual building date is unknown.) 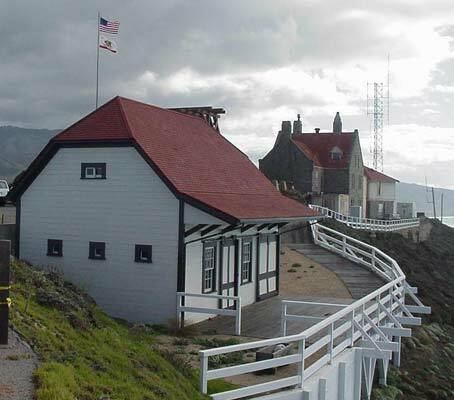 Until its restoration, which was completed in 2000, it served as a garage, a store-house and a recreation center, among other uses, until it was abandoned in 1974 when the Coast Guard closed up all the buildings and left Pt. Sur unoccupied. A deck for livestock collapsed sometime in the 1930s. By the early 1990s, the barn was leaning perilously toward the west and was twisting. Volunteers started to measure the "lean." In 1997, the barn was eased upright and a new retaining wall was erected on the east side to keep the rock itself from pushing the building over. CCLK contributed $30,000 toward construction of the new wall. State Park Restorer, Gary Nelson, was instrumental in hand digging the wall's foundation when no contractor could be found to do that work. With the wall in place and the building upright, work started on removing the lead paint. In early 1998, a ferocious El Nino storm hit Pt. Sur with 100+ mph winds and blew the barn into the new retaining wall three feet away. 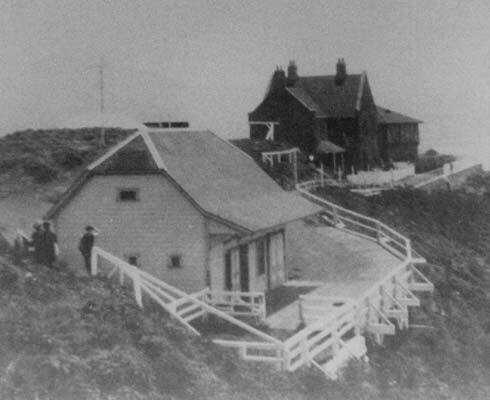 All the scaffolding erected for the lead paint removal was swept over the rock 300 feet to the beach below. But the building was still standing. Pt. Sur still had all of its original buildings. The road to Monterey was out, and would remain out for several months. Gary Nelson, a Big Sur resident, "tied" down the barn with large cables until funds and manpower could be assembled later to ease the barn upright again, now in the opposite direction, and restoration could begin. The volunteers contributed their own money and labor to put the deck back on the west face of the barn. In August 2000 the barn restoration was completed.